Where can I hike in Patagonia? Do you want to see Patagonia's highlights or discover it's wilderness? 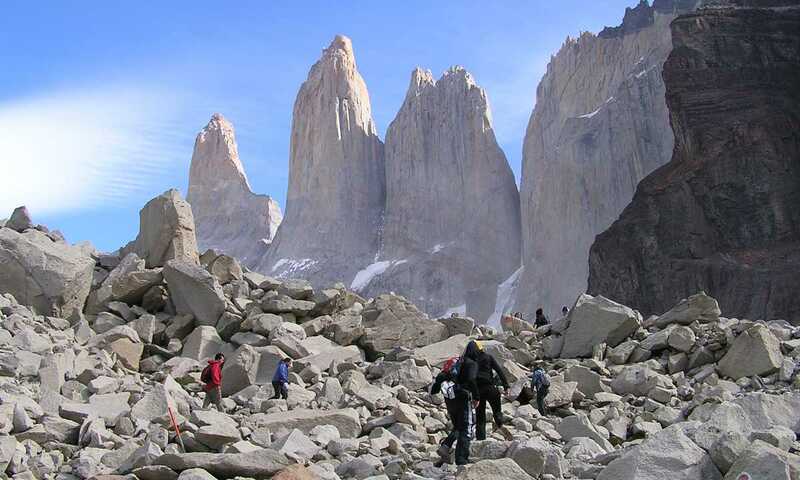 Classic Fitz Roy - Torre trails offer staggering peaks and huge glaciers but can get crowded. Tierra del Fuego or Aysen let you head into the wild and see pristine Patagonia. Do you want to hike from a comfy base or camp in the wilds? Lodges allow you to hike from a comfortable base; Refugios offer dorm rooms and a basic meal; or you can camp (with a porter for group equipment if needed). Are you an experienced trekker? There are hikes for people of all abilities, from short half day hikes to week long wilderness trails. Really experienced trekkers can get completely off trail. What sorts of landscapes do you want to see? Do you want to see the dramatic granite pinnacles of Paine and Fitz Roy or get lost in rainforest in the Queulat or Pumalin parks? Do you want to get stuck in the bogs of Tierra del Fuego after passing through over rocky ridges covered with hanging glaciers? How much do you want to spend? Some of the best day hiking is accessible from luxury lodges in the middle of nowhere. Adventurous souls on a budget can save their pennies doing some trails self-guided. There are few towns in the world better located for day hiking than El Chalten in the Fitz Roy range of Los Glaciares National Park. With hikes of 4-8 hours, you can get to the best viewpoints of Cerro Fitz Roy and Cerro Torre, and come back to town to a relatively well-priced hotel, and enjoy Chalten's bars and restaurants. These day hikes can be combined with a day of ice-hiking and a visit to the Perito Moreno glacier. 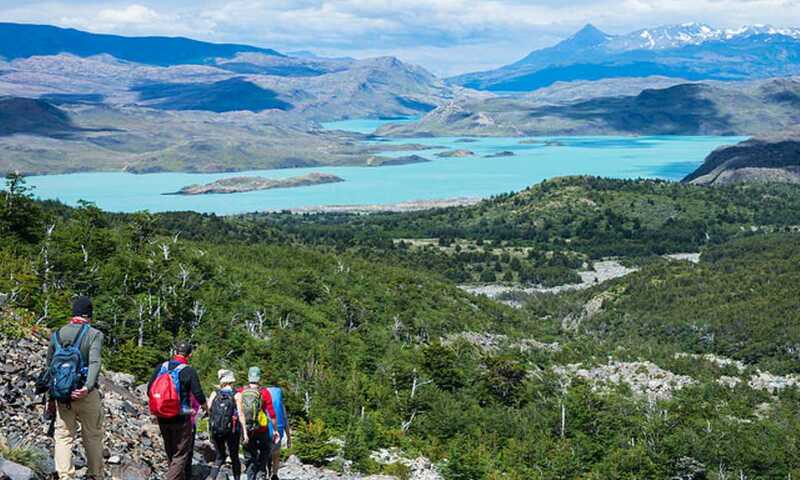 The trekking in Torres del Paine is world-famous, the W Trek being the route most people have heard of in Patagonia, but what they don't know is that most of this route can be done in three separate day hikes. There are also a number of less well-known trails: some of them are real bushwhackers, whilst others are easy trails from which you are likely to see flowers, guanacos and condors. Torres del Paine has a number of different places to stay that allow you to do day hikes from comfort; it is worth checking the location of these hotels or lodges to ensure that you won't be driving for hours to each trailhead. Day hiking in Torres del Paine is often more expensive than a multi-day trek because of the cost of transfers, but if you don't want to camp or sleep in dorms then day hiking is the answer. There are all sorts of options for day hikers in Tierra del Fuego: use Ushuaia as a base, ensconce yourself at the Lakutaia Lodge on Isla Navarino or take a cruise through the Patagonian Fjords. There are many many trails that head off from the Carretera Austral, exploring the steppe, the rainforest or the fringes of the Northern Ice Cap. If you have a car, you can drive from trailhead to trailhead and stay in some beautiful rustic lodges along the way. A multi-day trek in Tierra del Fuego allows you to really understand the wilderness of this region and how diverse the scenery is. From boggy pampas to beech forest to hiking the rocky ridges above the tree line. The Montes Martial Circuit is a short three day trek that loops up behind Ushuaia. The Sierra Valdivieso trek takes you right into the heart of Isla Grande before finishing your trip by boat and vehicle. On both these hikes you are likely to hike alone. The W Trek and Paine Circuit treks (also known as the 'O' Circuit) are Patagonia's classic treks and are arguably the best ways to discover the glaciers and towering granite of the Torres del Paine National Park. Due to overcrowding in recent years, the campsites and refugio beds along these routes have limited numbers and must be booked in advance, often getting booked up six months beforehand. The W Trek takes 4-5 days and is ideal for fit active walkers who prefer to carry a small 40-litre pack and hike from hut to hut either with a guide or without. The Circuit Trek is more challenging at 7-10 days, and camping is necessary in the northern sector. Fewer people hike the circuit and we would encourage anyone who has trekking experience to complete it. The Fitz Roy range is well known for its day hikes but camping in the heart of the Fitz Roy range allows you to see more - and to catch the sunrise on Fitz Roy and Cerro Torre peaks. A classic route lasts two or three days and links Laguna de Los Tres and Laguna Torre into a circuit. Stronger hikers (and lovers of scree) can extend this classic trek by a day, to explore the Electrico Valley, or two days, to cross the Agachonas pass into the Tunel valley and up to the Paso del Viento on the Chalten Mountain Escape Route. Many old horse trails cut their way through the Aysen region where the pioneers made their way from estancia to estancia. One of these routes links Chile with Argentina, allowing you to hike between the Fitz Roy region and Aysen. The four day Jeinimeini to Aviles trail in the new Patagonia Park is a gem. Starting in the vibrantly colourful Jeinimeini reserve, you pass through beech forests before descending into the botanical Chacabuco valley. The Cerro Castillo range towers above the Carretera Austral in the Ibanez valley and experienced trekkers can hike between 3-6 days crossing passes, reaching crystal glacial lakes and marvelling at the rocky outcrops. So many people travel to Patagonia to hike the W trek, and it is a fantastic trek, but we would encourage you to hike deeper into Patagonia - you'll discover so many other truly extraordinary trails. We've spent years hiking and there are still trails to be discovered. These routes are definitely for those people who not only have plenty of experience but also want to add a bit of an edge to their 'holiday'. Some people describe it as 'Type 2' fun - the kind of experience that might well be a little too challenging at the time, physically and mentally, but you know you'll look back on it with glee and satisfaction. The Patagonian Ice Cap is the third largest mass of ice on the planet and, bordered by Cerro Fitz Roy and the Andes, the landscapes are truly unique. The ascent is a long, challenging day and conditions on the ice cap itself can be very tough indeed, but when the skies are clear you'll have a view like no other. The main trails of the W Trek and Full Circuit have been on the map for decades now and they are well-marked. If you want to get off-the-beaten-track, find unique views of the Paine Massif and explore mountain passes, valleys and glaciers that no one else knows about, then you'll need to head out with a local mountaineering guide who has been exploring the area for decades themselves. Tierra del Fuego remains more wild and remote than many of the national parks to the north. Trails are not maintained and the terrain is tough whether on the lower ground or up through the mountain passes. The 7 day crossing of Tierra del Fuego is a real wilderness experience. There are also opportunities, for larger groups with more time, to trek through the seldom explored Darwin mountain range in Chilean Tierra del Fuego. Experiencing the vastness of the Southern Patagonian Ice Field in person was indescribable. All of our guides were extremely professional and knowledgeable about all aspects of the area. Most importantly, the guides offered great conversation which helped to make some of the longer tougher hikes less grueling and gave us tremendous insight on the lives and people of Patagonia. I will tell my Grandchildren about the beauty of the land and how me and my 62 year old knees climbed a mountain! I was 18, on the first multi-day trek of my life and we were basically bushwhacking into this valley where the gauchos herded their sheep. The rocks were red and purple and it was just...empty land. When is best to hike? The main trekking season runs from November to March in most destinations. This is when most of the facilities are open, buses are running and the weather is at its best. If you want to see the spring flowers and more snow on the peaks then November is a beautiful time to go. For the Autumn colours then consider late March and early April. Snow and ice conditions for mountaineering and ice cap expeditions will be best from November to January. Patagonia is a popular destination, and especially so mid-December to mid-January, so if you want to hike the most famous routes then try to visit outside the busiest period, or consider the more off-the-beaten-track routes at this time of the year. It is possible to trek all year round? Winter in Patagonia (May - August) offers less daylight and colder temperatures. In the Chilean Lake District and Tierra del Fuego there's a lot of rain however in the south and east of Patagonia there's generally less rain and visibility can be better than the peak of summer. Head over to our when to visit page for more information. The famous trails of Torres del Paine and Los Glaciares are well marked and well suited to independent hiking for those with experience. Guides can help you access the more remote and lesser known spots that in many cases are equally dramatic. Having spoken to over a thousand people who have visited the region, our view is that guides bring so much more than safety and navigation - a richer awareness of the region's wildlife, ecology, history, and cultural identity. For those on a tight budget, self-guided hikes on the main trails of Torres del Paine and Fitz Roy will be a tremendous experience. Those who are experienced and fiercely independent might do well to mix some guided days with some independent days. Visit our hiking page for more juicy details on the best hiking in Patagonia. Can I combine trekking with other activities? By leaping on a horse or into a kayak you can get truly off the beaten track. If you are really intrepid you might consider sailing through the Patagonian Fjords and using the boat to access some fantastic remote hiking. Do I need to acclimatise to the altitude? The highest peak in Patagonia is 4058m (13,314ft) high and most of the trails don't go higher than 1,500m (4,920ft) so you don't need to acclimatise when you go hiking in Patagonia. How much does hiking in Patagonia cost? Typically a guided, fully supported trek (with enough porter support that you just carry your own gear including sleeping bag and sleeping mat or hut accommodation) costs US$300-350 per person per day. Self guided treks will be cheaper and hiking from a luxury hotel will be 2 or 3 times more expensive. There are regional differences in costs so if you find Torres del Paine very expensive then have a look at Tierra del Fuego or Aysen. Splurge for the refugios (sleep is important), bring gaiters for the snow, bring cash for drinks at refugios, have quality boots, quality outer-jacket, bring blister care materials. I wish I had brought a microfiber quick dry towel for the trip - the other 2 guys said Swoop recommended a towel in their list but I missed that!